"By the command of the Indestructible Being, minutes, hours, days and nights, stand apart. By the command of the Immortal Brahman, months, years, seasons and solstices stand apart. He who knows this Indestructible Being is a liberated sage or Jivanmukta. "Divine grace must be matched, must be responded to, must be augmented by human endeavor and effort. God’s grace and human effort bring about divine experience." "" Purushartha, sadhana and abhyasa are all one. They are the great need. In the Gita, Lord Krishna plainly states that that which is seemingly impossible is possible. 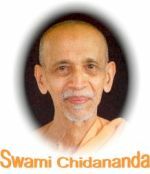 Sadhana must become second nature. It should also be progressive.
" 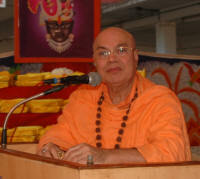 .... Prayers, Best wishes and Greetings for New Year 2011. 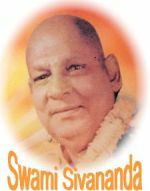 May Almighty Lord and Sri Gurudev Swami Sivanandaji Maharaj’s Grace be ever upon you all. May you all rejoice everlasting peace and supreme blessedness. "Seek ye first the kingdom of God, and everything shall be added unto you." This is the one great duty, this is renunciation. Live for an ideal, and leave no place in the mind for anything else. Let us put forth all our energies to acquire that which never fails--our spiritual perfection. If we have true yearning for realization, we must struggle, and through struggle growth will come. We shall make mistakes, but they may be angels unawares." "Do not go for glass beads leaving the mine of diamonds. This life is a great chance. What, seekest thou the pleasures of the world? He is the fountain of all bliss. See for the highest, aim at that highest, and you shall reach the highest." "Learn to feel yourself in other bodies, to know that we are all one. Throw all other nonsense to the winds. Spit out your actions, good or bad, and never think of them again. What is done is done. Throw off superstition. Have no weakness even in the face of death. Be free." "Meditation means the mind is turned back upon itself. The mind stops all the thought-waves and the world stops. Your consciousness expands. Every time you meditate you will keep your growth." "In this external world, which is full of finite things, it is impossible to see and find the Infinite. The Infinite must be sought in that alone which is infinite, and the only thing infinite about us is that which is within us, our own soul. Neither the body, nor the mind, nor even our thoughts, nor the world we see around us, is infinite." "Realize your true nature. That is all there is to do. Know yourself as you are—infinite spirit. That is practical religion. Everything else is impractical, for everything else will perish."